With limited job openings, employers have to go through numerous applications and have little to differentiate between candidates, making the hiring process that much more difficult. ValidateJOB provides tools and services for job applicants, who would like to differentiate themselves and in the process, make it easier for an employer to hire them. 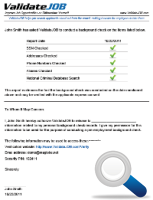 ValidateJOB Report is a pro-actively obtained background check report, which provides a summary of the checks that have been conducted; without revealing any personal information. ValidateJOB can be useful in quite a few situations where a job candidate is keen to show their self-confidence and sincerity, by taking the initiative of obtaining a ValidateJOB Report and including the summary as an element of the job application. Organizations have always appreciated job seekers who exhibit confidence and take initiative to realize their goals. This may be a definite indicator of what they could expect from an individual while at work. ValidateJOB provides job applicants a simple tool to differentiate themselves and improve their job prospects. Copyrights © 2014 & All Rights Reserved by ValidateJOB.